full of treasure? well, maybe. Coober Pedy has a lot to offer. For instance, it's other-worldly and decidedly bleak terrain has been the backdrop for many dystopian movies and such cult classics as The Adventures of Priscilla, Queen of the Desert. It is also the opal capital of the world. We had read much about all these facts. We had been told that to properly experience Coober Pedy, we needed to spend at least three days. We confined our sight-seeing on this northbound portion of the trip primarily to the supermarket. By visiting markets, you can get a good sense of a culture. Australia is really no exception. 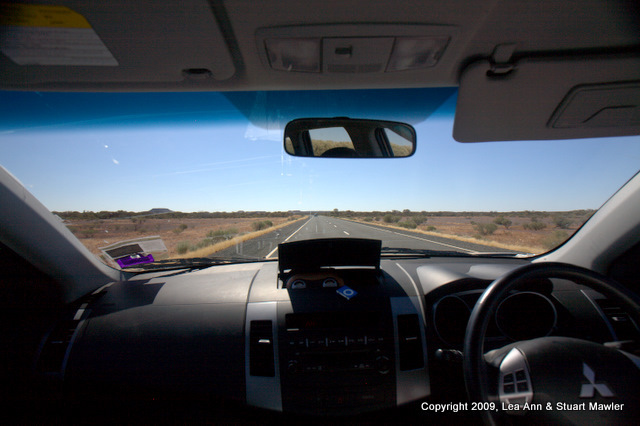 To be fair to Outback Australia, it is actually the new highways that are boring. We were quite entertained the entire time we were on the Oodnadatta Track. Stuart was, however, incredibly dull. The Stuart Highway, that is. Following the obligatory tank of petrol, we got back on the road as soon as we could. Rest assured that Lea Ann is actually over there driving the car somewhere off the right side of the frame of the picture in the inset. Note also incredibly straight road extending eternally out ahead of the dash. This stretch of mind-numbing pavement brought to you by our portable speaker and iPod shuffle. Really, it was not Coober Pedy's fault (entirely) that we were so eager to leave. We had places to be and, thanks to the rain, had run quite late the day before, so we were determined to get to Uluru (Ayers' Rock) before midnight. All that said, we did manage to take a few pictures. 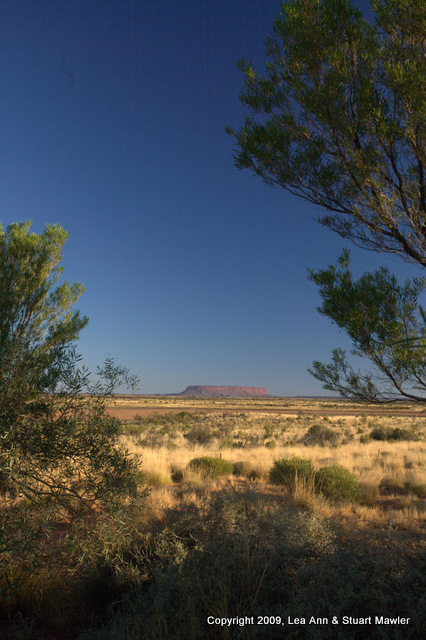 Finally, after nearly an entire day of driving, we sighted Uluru, that great rock, standing majestically in the distance! So why is Mt. 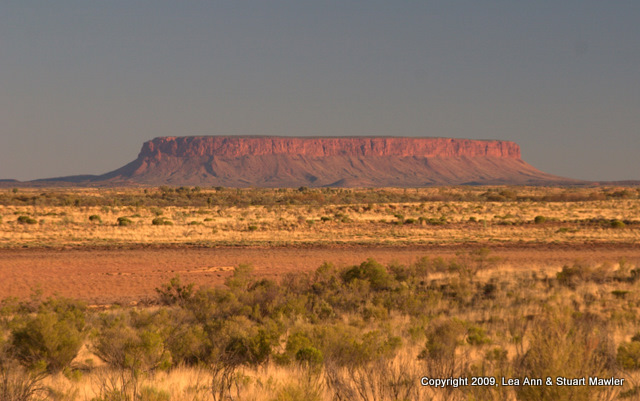 Conner able to fool so many people into thinking it is actually Uluru? Well, it probably has something to do with the mostly featureless landscape. The first time you see something poking up out of the plains, you are ready to believe you have found Shangri-La. Regardless of the nefarious intentions of this little mountain, it is quite pretty, so we took a few pictures and decided not to press the issue. 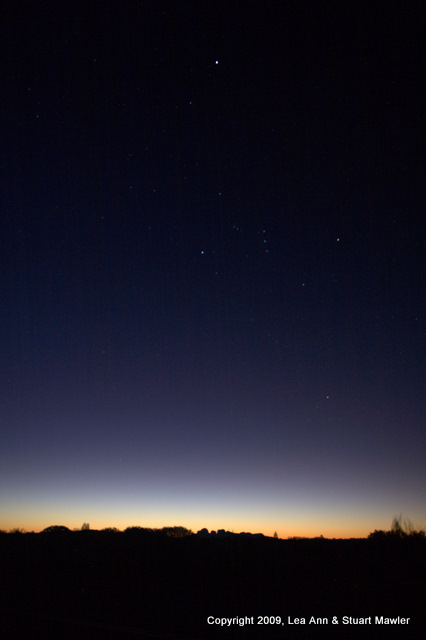 Besides, as you can see, the light was changing rapidly as the sun neared the horizon. In such situations, it is imperative to move on to the next place so that we can take nearly dark abstract pictures. We managed to accomplish this goal nicely. Not too long after Mt. Conner, one arrives at Yulara, which is the resort built to contain visitors to Uluru and Kata Tjuta National Parks. Just beyond Yulara is the entrance to the park. By this time, the sun had just dipped below the horizon, so everyone was leaving the park. We headed in. Seeing the never-ending stream of cars coming from the rock itself, we decided to go the other way and drive toward Kata Tjuta ("The Olgas"). 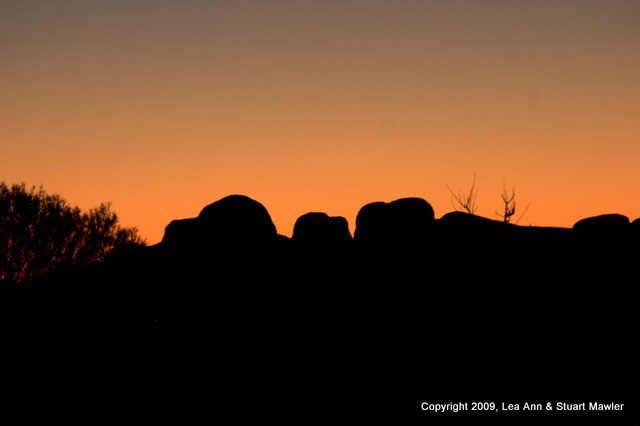 The advantages of Kata Tjuta over Uluru are numerous, primarily including that many, many fewer people go there and it is to the west, making for some excellent sunset potential. 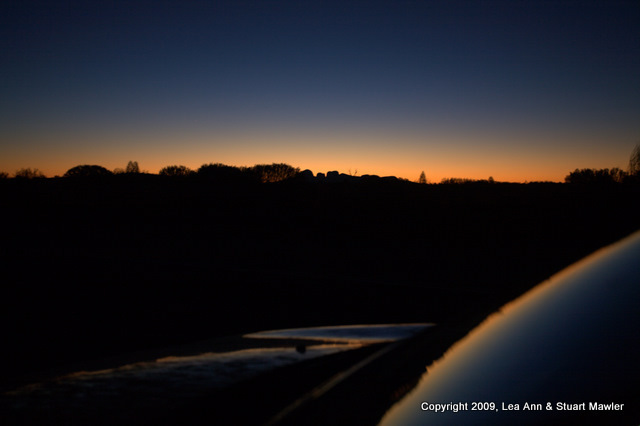 At a turnout, we constructed one of our many highly abstract sunset pictures involving the truck, the sunset, and a whole lot of reflections. Thinking about it now, we have no idea why the reflections were so crisp on the truck. After all, the thing was covered with enough red dirt to make Richard Leakey get out a brush and begin looking for the origins of life. In the center of the horizon in the reflection picture above, you can just see a little notch. That notch is one of the gaps in the rock formation that is Kata Tjuta. Not very impressive at that zoom, so perhaps a closer view would be better. Having created what looked like a good series of the rock formation, we set about trying to capture the stars and the sunset at the same time. 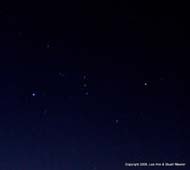 The best part is that Orion was visible at the time, giving a common point of reference between northern and southern stars. Even better than seeing Orion was realizing that (exactly as physics would predict) he was upside down. 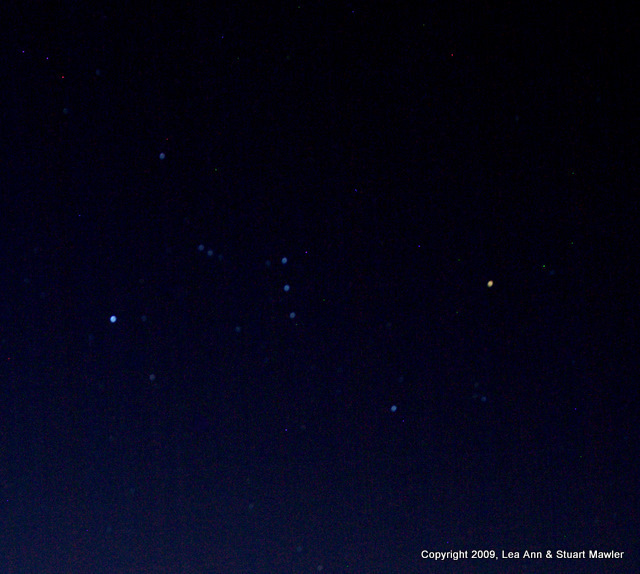 If you click on the image above-right, you can just make out Orion to the right of center-frame. 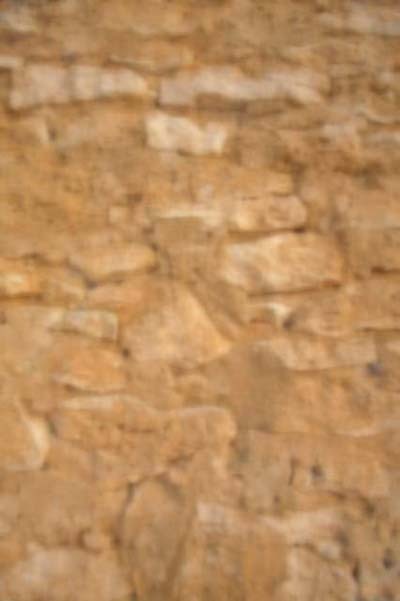 If that is still a bit too small for you, try this next picture, where we cropped out everything but the man himself. Keep in mind that we only had a tiny table-top tripod and the roof of the truck, which makes these pictures even more awesome, if we do say so ourselves. "Extreme Improvised Photography"
Naturally, we kept at this well past the point where other people would have fallen asleep or become terminally cranky. In our case, a nice park ranger stopped by to tell us to clear off. Fortunately, she was also able to tell us that unidentified large creature that flew into the truck was just a moth. Satisfied (and properly chastized), we left the park to find a room somewhere in one of the five or six hotels in Yulara. They have a hotel in basically every category of stars -- five stars, four stars, etc. They also have a bunk house, camping, and a whole bunch more. 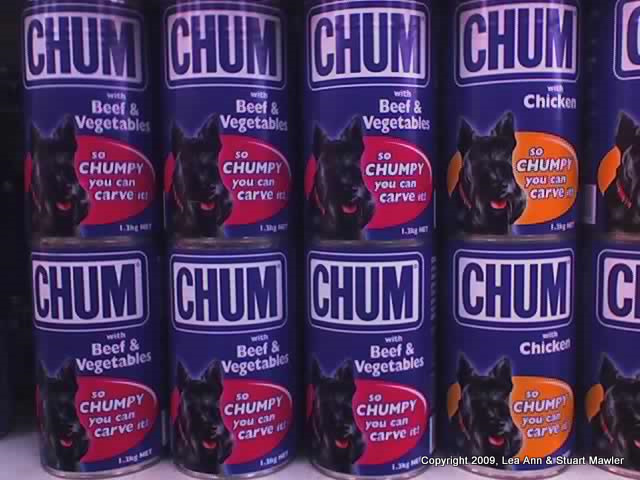 You can spend quite a bit of change here. The only real problem with the place is that they want it to be a true Outback ExperienceTM, so they don't put up very good signs anywhere. You just have to know where you are going. This is probably ok in the daytime, but difficult for a first time visitor in the dark. So what if most people don't show up in the dark? Is that our problem? As fortune would have it, we found the best hotel for us (The Lost Camel) and immediately prepared for the next day of poking around Uluru and Kata Tjuta.